Canadian scientists are becoming progressively alarmed at the increasing rate of melting of the country’s glaciers, warning that climate change is having a severe impact on the region. Anyone concerned about climate change and sea level rise often thinks about melting glaciers in Antarctica and Greenland. But after these two, Canada has the largest amount of glacial ice: some 200,000 square kilometres. One of the scientists who is increasingly concerned is Gwenn Flowers, a glaciologist from Simon Fraser University in British Columbia, who has been researching glacial retreat and melting in the Yukon for over a decade. Her team is currently mapping the ice retreat on the Kaskawulsh glacier in the St. Elias mountain range, which is 70 kilometres long and 5 kilometres wide, with ice some 800 feet deep at some places. Flowers calls glaciers “fantastic barometers of climate change”. However, Flowers says: “The thinning is really dramatic here” and adds that she believes that the ice is currently melting at about half a metre a year. Indeed from 1977 to 2007, the Kaskawulsh glacier is reported to have lost 17 square kilometres of ice. “We as Canadians are stewards of about a third of the world’s mountain glaciers and ice caps, so this is our responsibility”. This is not the first time the Kaskawulsh glacier has made the news. Research published last year in the journal, Nature Geoscience, outlined what was called “river piracy”, in which one huge river suddenly flows into another. For centuries, the Slims river had flowed north carrying meltwater from the Kaskawulsh glacier towards the Bering sea. 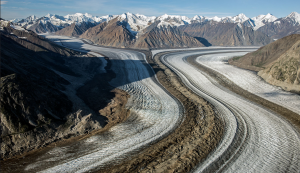 However the unusually hot spring in 2016 caused an intense melting of the glacier that cut a new channel through the ice to the Alsek river, which flows southwards and on to Pacific. Where once the two rivers were comparable in size, the Slims was reduced to a trickle and the Alsek became 60-70 times larger. Earlier this year, the Alpine Club of Canada issued its annual State of the Mountains report and warned that “the beheading of Slims River” is likely to be “permanent,” and argued that phenomenon could happen elsewhere as the world’s glaciers retreat. Featured image is from Richard Droker.